“The only way to leave our children blessed and happy is to leave them rightly instructed in God’s true religion. For what avails all that is in the earth, if perpetual condemnation follows death – yea, and God’s vengeance also goes before the same? as of necessity they must where true knowledge of God is absent. And therefore God straitly commands the fathers to teach their sons the laws, ceremonies, and rites. And unto Abraham he opened the secret of his counsel touching the destruction of Sodom and Gomorrah: “Because,” says the Lord,“I know that Abraham will teach his children, that they fear my name.” [Gen. 18:19] Then God would that the life and conversation of the fathers should be a schoolmaster to the children. Plain it is, that the true knowledge of God is not born with man, neither yet comes it unto him by natural power, but he must have schoolmasters to train him up in that which he lacks. The chief schoolmasters (the Holy Ghost excepted) of the age following, are the works, practices, and life of the forefathers. And experience does so teach us, that the children are so bound and addicted to the works and practices of their fathers (and especially if it is in idolatry), that scarcely can the power of God, speaking by his own word (as the prophets oft complain), reave or pluck any back from their fathers’ footsteps. that, consenting to Jeroboam and to his idolatry, left to their children a pattern of perdition. What image [do] you show to your children; yea, in what estate [do] you leave them, both touching body and soul? Blinded in idolatry (alas, I fear and tremble to pronounce it), and bound slaves to the devil, without hope of redemption, or light to be received, before God takes vengeance upon their disobedience! I speak to you, O natural fathers: Behold your children with the eye of mercy, and consider the end of their creation. Cruelty it were to save yourselves, and damn them! But O, more than cruelty and madness that cannot be expressed, if, for the pleasure of a moment, you deprive yourselves and your posterity of that eternal joy that is ordained for them that continue in confession of Christ’s name to the end, which assuredly you do if, without resistance altogether, you return to idolatry again. If natural love, fatherly affection, reverence of God, fear of torment, or yet hope of life move you, then will you gainstand that abominable idol; which if you do not, then, alas! the sun is gone down and the light is quite lost, the trumpet is ceased, and idolatry is placed in quietness and rest. But if God shall strengthen you (as unfeignedly I pray his Majesty may), then there is but a dark misty cloud overspread the sun for a moment, which shortly shall vanish, so that the beams afterwards shall be sevenfold more bright and amiable nor [than] they were before. Your patience and constancy shall be a louder trumpet to your posterity, than were all the voices of the prophets that instructed you; and so is not the trumpet ceased so long as any boldly resist idolatry. And, therefore, for the tender mercies of God, arm yourselves to stand with Christ in this his short battle. Flee from that abominable idol, the maintainers whereof shall not escape the vengeance of God. Let it be known to your posterity that you were Christians and not idolaters; that you learned Christ in time of rest, and boldly professed him in time of trouble. Think you these precepts are sharp and hard to be observed? And yet again, I affirm, that compared with the plagues that assuredly shall fall upon obstinate idolaters, they shall be found easy and light. For avoiding of idolatry you may perchance be compelled to leave your native country and realm; but obeyers of idolatry, without end, shall be compelled, body and soul, to burn in hell. For avoiding idolatry, your substance shall be spoiled; but for obeying idolatry, heavenly riches shall be lost. For avoiding of idolatry you may fall in the hands of earthly tyrants; but obeyers, maintainers, and consenters to idolatry shall not escape the hands of the living God. For avoiding idolatry, your children shall be deprived of father, of friends, riches, and of earthly rest; but by obeying of idolatry they shall be left without the knowledge of his word, and without hope of his kingdom. Works, 3:40-41; Selected Writings, 1:30. Strong words from John Knox during an early debate with a Roman Catholic … Comments? Knox: “Because, the kirk ought to do nothing but in faith, and ought not to go before, but is bound to follow, the voice of the true Pastor. 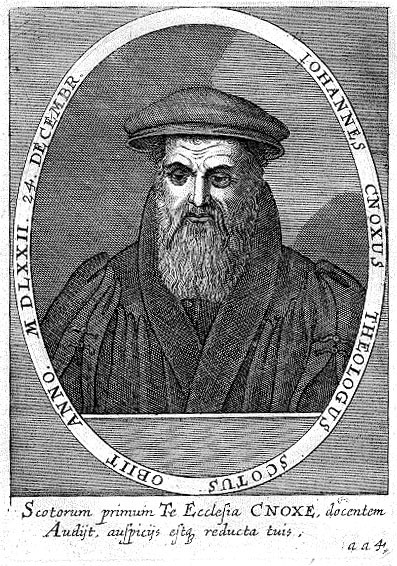 Selected Writings of John Knox (Dallas: Presbyterian Heritage Publications, 1995), 1:12-16.